Are your hands too small to play guitar? Do you have any trouble playing those 'stretchy' scales and chords that other guitarist can play with ease? 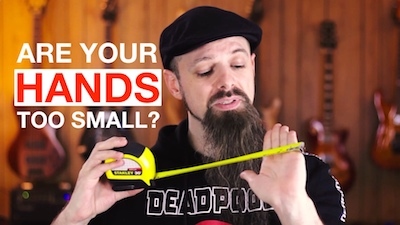 Do you think that the size of your hands is holding you back? If you have small hands, I do really understand your plight. I have fairly small hands too (in fact many of my female students have larger hands than mine! ), so I know how frustrating it is to not have that extra hand reach that other players naturally have. At this point I would really like to tell you that there is a miracle method to make your fingers longer - but sadly that method does not exist. As you can see, just changing your hand position has a MASSIVE impact on your hands reach! If you need help in learning how to play the guitar, check out all those awesome free resources that will make a difference in the way you think about and practice your guitar.